Heading to the US Pacific Northwest coast? 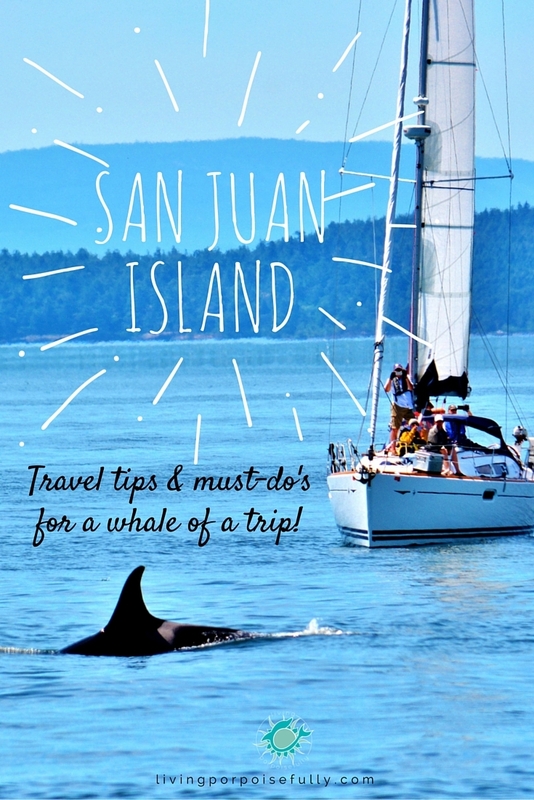 Don’t miss San Juan Island, it’ll make for a whale of a trip! We’re back from our summer trip, and can’t wait to share our Pacific Northwest experiences with you! We started off our trip with San Juan Island, and boy, it did not disappoint. First of all, San Juan Island is just gorgeous. The scenery was like no where else we’d been and it had a just-right climate, which was a welcome treat to escape from the hot & humid Southeast in the middle of summer. What did we do in San Juan Island that made it truly a whale of a trip? After flying into Seattle, we drove straight out to catch the ferry over to San Juan Island. Who would have thought that we’d steal breathtaking views while waiting to board the ferry!? After a long day of travel, the ferry ride was a beautiful (and windy!) chance to relax and soak in the scenery. After getting to our hotel and settling in, we dined at Roche Harbor and then tucked in for a much-needed good night’s sleep. After breakfast, we embarked on a whale watching boat ride! It’s been on our bucket list to see orcas in the wild, and we can gratefully say it was one of the most memorable experiences we’ve ever had. San Juan Island is famous for its orcas that can be found year-round, along with three pods that visit from spring to fall. But even here, whale watching is a bit of a hit-or-miss endeavor in that you’ll never know what you might see or if you’ll actually get to see any whales. But we were incredibly lucky: after 26 days of no orca sightings, we were bestowed with the appearances of several orcas in early June! Take a look, words can’t quite do it justice. And one came close enough for us to get a sequence of it coming up for air! Tip: You can tell a male from a female by their dorsal fin! Males have a larger straight fin (like in the picture above), while females have a smaller and more curved fin (like in the picture below). Not only that, you can identify individual orcas based on their fin and markings. We kept our eyes out for Granny, born in 1911!!! With several orcas swimming in the area at once, we had a 360 degree show — swiveling our heads wherever we heard a spout of exhalation or saw a black-knife looking fin pierce through the surface. Getting to see these incredible creatures in the wild was something we will never forget! Simply exhilarating. Bring a good windbreaker and wear layers. It can get windy and the temperature can change quite a bit! Go with a good company that brings full enthusiasm and a bit of education too to your experience. We loved the San Juan Safaris company. Soak in every splash, fin appearance, and tail slap. To see any one of these is truly a magical moment! After our 10:00am whale watching tour, we got back at a good time to feed our appetites with lunch at Cask & Schooner in Friday Harbor. The. Food. Was. Incredible. Once our bellies were happily full, we explored the rows of shops, soaked in the seaside views, and even checked out the whale museum. After quite the day of orca sightings, we were on such a high that we felt our trip was complete (but it only just started!). So we headed out to Lime Kiln State Park (aka “Whale Watch Point”) with high spirits and no expectations. Tip: Remember to be gentle at tide pools! A gentle two-finger touch, and careful stepping are musts to keep the critters happy. After letting our inner kids take over for awhile, we moved off of the rocks and began to walk along a beautiful seaside trail. So we ran to find an orca cruising not 20 feet from where we were tide pooling! We couldn’t believe our luck. We weren’t able to snap a shot, but we hurried to follow her along the rocky shoreline. Our eyes were glued to the sea and we completely lost track of time looking for spouts in the distance. Several in the pod made their way along the coast, and a mom and her baby were among the pack! With our eyes on the water, we also glimpsed a seal and sea lion! After saying goodbye to the orcas fading away in the distance, we explored the rest of San Juan Island. South Beach (quite different from South Beach, Miami!) was beautiful and there were mounds of driftwood for as far as you can see. Then we went to Roche Harbor to eat at Madrona Bar and Grill and soak in the harbor views right on the deck. Delicious food (sustainable seafood!) and amazing views made for the perfect setting for relaxation. The Hotel de Haro in Roche Harbor right next to the restaurant has a spectacular flower garden, full of vibrant flowers, bees, and hummingbirds! We wrapped up our last night in San Juan Island with sunset views of Roche Harbor. We can’t say enough about the natural beauty and scenery that we experienced on San Juan Island! It was an amazing couple of days that made for an unforgettable trip…a whale of a trip to be exact. We hope you enjoyed the escape with us! Want to get planning your trip? This San Juan Islands website might come in handy.